Due to the sort of logistic issues that make being a grownup so much fun, it was a few minutes after the kickoff of Sunday’s game between the Bills and Tennessee before I got myself in front of a television. The rookie eluded the pass rusher who immediately appeared in the backfield, started running upfield to his left, cut back to the middle of the field, and found a gap between four more hostile Titans that provided room to get close enough to dive across the goal line for the game’s first points. As far as moments that triggered an audible reaction from those gathered to observe the Sunday ritual of Bloody Marys, chicken wings, and draft beer—at My Saloon or in hundreds of places like it around Western New York, I feel confident in saying—that would be about it for the day. There were still nine minutes and three seconds remaining in the first quarter. For the ensuing 150 minutes or so, the Bills and Titans put on a master’s class in mediocre football. Short passes and shorter runs won the day, with each offense operating as if the opposing end zone was lined with land mines. If your taste in football runs to missed passes and made field goals, this was a masterpiece with few equals in the Bills’ 59 seasons. Neither team managed a drive that covered more than 54 yards—barely half the length of the field. Buffalo’s longest march was good for 47, which they managed twice. The first, set up by a Titans fumble, ended with Allen’s dive across the goal line. The Bills repeated the modest accomplishment with what amounted to a five-minute drill at the end of the game. It was far from your typical last-minute comeback, involving eight runs by LeSean McCoy or Chris Ivory, with two short completions by Allen mixed in, leading to Stephen Hauschka’s decisive kick. Not that the Bills did not give avoiding their second victory in three weeks their best shot. As in the one loss during that span, the previous Sunday in Green Bay, Allen’s line and receivers left him largely to fend for himself. On the occasions he did have both a spare second and a target at least somewhat open, Allen sprayed throws above, beneath, and around intended receivers. He finished with 10 completions in 19 attempts for just 82 yards, with those two connections on the final drive accounting for 20. 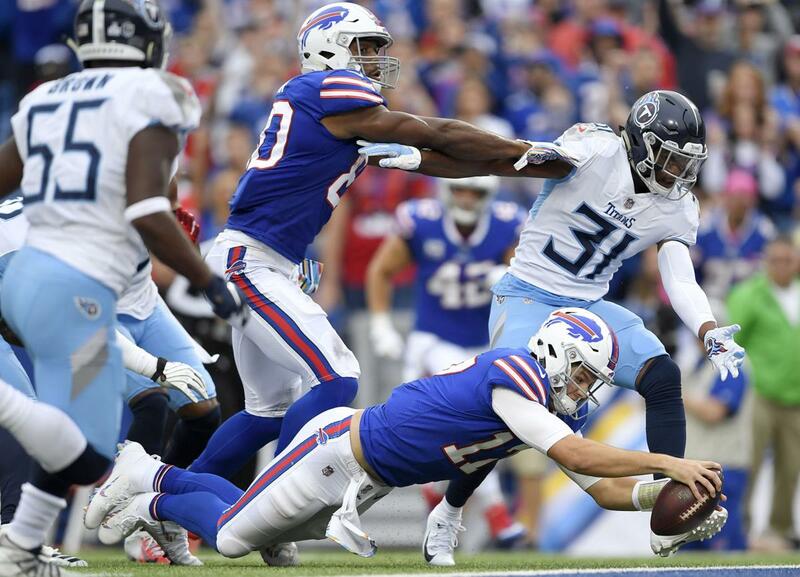 Allen’s interception on Buffalo’s previous possession allowed Tennessee to complete their slugging, zombie-like comeback that briefly gave the Titans a two-point fourth-quarter lead. The 13-yard hookup with McCoy, who covered most of that after catching the ball, represented Buffalo’s longest pass gain of the day. His 16-yard run up the middle in the first quarter was Buffalo’s longest, period. Buffalo punter Corey Bojorquez nearly handed the game to the Titans in the Billsiest of manners, deciding to run a fake field goal that none of his teammates, his coaches, or anyone—with the apparent exception of the entire Tennessee defense—saw coming. His kicking partner eventually bailed him out, however, as time expired. So the Bills head to Houston at 2-3, somehow just a game out of first place in the AFC East despite having accumulated the fewest points in a league on pace to shattering its own scoring record. Buffalo’s second win resulted from the same formula as the first: Get an early turnover, take the lead, and hold on as tight as a disgraced accused felon trying to cling to a Congressional seat. Not to belabor Buffalo’s offensive ineptitude, but 13 of the other 31 teams are within a touchdown of accumulating twice as many points as the 63 the Bills have managed (27 of them in the Week 3 shocker against the Vikings), mostly set up by turnovers produced by the defense, or better. The Saints, Chiefs, and Rams have nearly tripled Buffalo’s offensive output. In the four games that did not take place in Minneapolis, Buffalo has averaged nine points per game. The least prolific Bills offense ever, the 1985 edition quarterbacked by Vince Ferragamo and Bruce Mathison the year before Jim Kelly came to town, averaged 12.5. In Sean Mcdermott’s first season, he somehow coached a team with an offense and defense that each ranked in the NFL’s bottom 25 percent into the playoffs. Unless Allen and the rest of the offense start carrying their weight, or at least some of it, thinking about a top-five draft pick next spring is far more realistic than even beginning to contemplate repeating last year’s highly unlikely accomplishment.